Oh this took me right back to the 1960’s when we lived close to a park where gorse bushes abounded. 🙂 Beautiful post, Sarah. So glad to have triggered a glorious memory for you, Sylvia 🙂 The gorse bushes abound close to where I live, too, but on hills rather than on low ground. 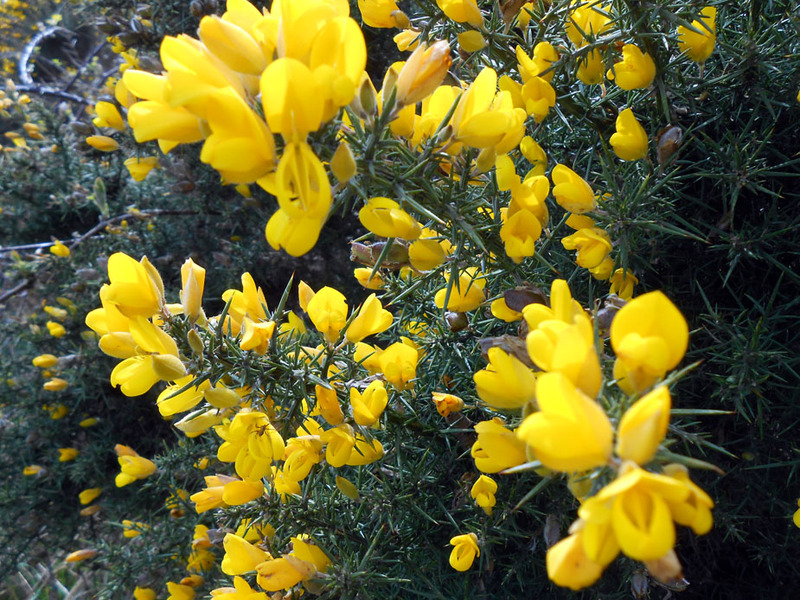 The gorse bushes are luminous at the moment, thorns filled with beauty! They certainly are luminous. They were even managing to glow through some low cloud swathing the South Downs the other day! I love the idea of plants defending themselves which of course they do!! Lovely image too. Thank you, Cybele. Gorse is amazing as it defends itself against unwanted creatures, yet flashes bright at the bees! Thank you, Christina. I’m so happy that you’ve called my blog eclectic, as this was my aim when I started it. The photography part improved, after Mister gave me a Nikon camera. For the first year, either I had to rely on photographs taken on a rather archaic camera, or finding free images on line, which made posting stuff exceedingly long-winded.